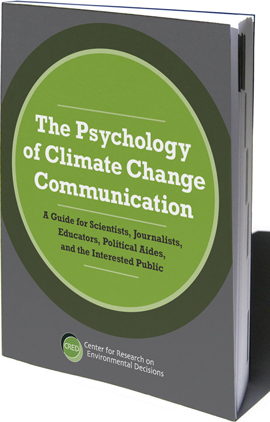 Welcome to the online home of the CRED Guide: The Psychology of Climate Change Communication, published by the Center for Research on Environmental Decisions at Columbia University. The guide is available in its entirety on this site, by clicking through the contents menu at left. You can also download a PDF of the guide or request a paper copy, below. For the most accurate display of the guide, be sure to use Adobe Reader version 9.0 or later, available for free download here. We can currently only mail to US addresses.